The hotel boasts 12 meeting rooms, the largest of which accomodates up to 300 guests. 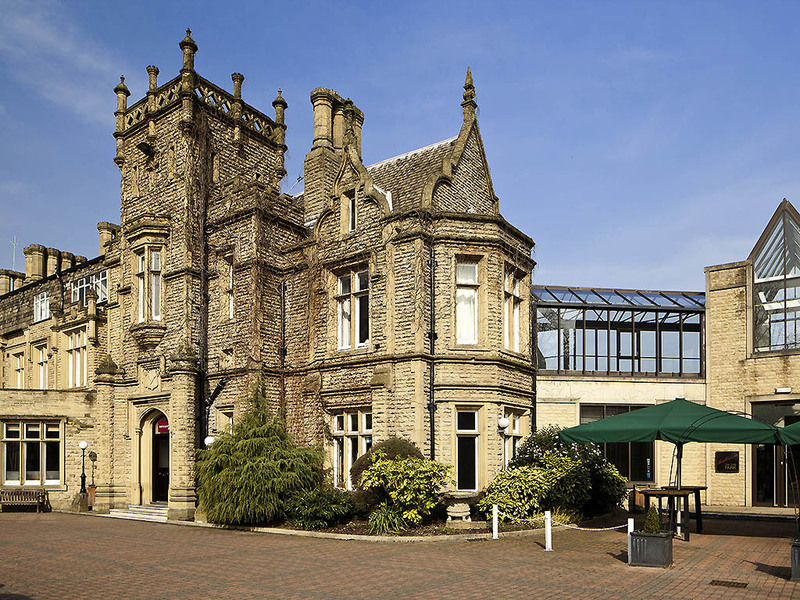 Along with superb function rooms and landscaped gardens, Mercure Bradford, Bankfield Hotel is also one of the top wedding hotels Bradford has to offer. In addition, the hotel also regularly hosts self-catered Asian weddings in the impressive Ballroom on the Park. With a licensed pergola for outdoor weddings and stunning grounds for great wedding photos, it's the perfect place to tie the knot. Very helpful staff who were let down by poor facilities (hot water/ heating) poor dining options and noise. Too many menu items not available and breakfast had very limited options (no orange juice!!) Hotel seemed unable to cope with high level of occupancy. Me and my husband stay at the hotel maybe once every month or every other month for one night and we are always satisfied and happy when we leave. Upon arrival, there was a wedding and all the guests were blocking the entrance to the hotel in which case we had to go sit back in the car because they were taking their pictures. After 15 mins, we tried to get in again in which again the guests were all stood in the way, so we had to ask politely if we could just squeeze through. The guests at the wedding were very loud and rude as we passed through. The reception/lounge area was covered in confetti and looked an absolute mess but this didn’t affect us as we could understand the circumstances. We then waited at reception for a few minutes until we noticed we had to call somebody in order to get their attention, so we dialled the number as requested and continued to wait for a few more minutes. Then a gentleman appeared and apologised about the wait, the check process was very quick and efficient as always. However, a young lady had to go and check to see if the room was ready which took another 5mins of standing around with all these loud noisey wedding guests. Once the room was approved me managed to get up the stairs to the corridor of our room, when another load of wedding guests were stood around, making a lot of noise and not being reasonable towards other guests. I then asked politely if they would excuse us so we could get to our room which they huffed and puffed about. Once we were in the room it was very cold and when I went to turn the heating up it was on full heat but was only slightly warm from the top of the radiator. This was very disappointing. My husband used the bathroom and the bath still had cleaning products spread all over the bath like an attempt to clean was made. However, there were hairs all over the tiling by the bath and it just looked like no effort to clean had been made. We normally just come for one quite night away but unfortunately it wasn’t to our expectation. The location is very convenient for us and we usually enjoy staying here. I feel like the wedding guests should have a separate entrance to the hotel or maybe asked not to block the entrance and maybe to consider other guests. This was a very disappointing stay. The hotel is very tiered and needs a refurb. The room was tiny even though we booked a classic room. The service was very slow, looks like they were working on less than a skeleton crew. The bar meal was awful and breakfast was basic. The poor waitress was on her own and could not clear and reset tables at breakfast quickly enough for people coming in. She was so polite and needs a pay rise. Would not book again. I got married at the hotel. I stayed in the quad suite. They staff on reception were lovely and helped move my things into my room. The suite was clean, however we only had half a toilet roll and nothing much for the kettle. We expected to have our items for our wedding taken that same night to decorate however they were still there the next morning. We had to ring down to question this and they were unsure where everything went. The coordinator was on a day off, we had gone through everything with her and we had left instructions but they seemed unaware. However the set up of the rooms for the wedding were lovely. We were told to check out at 12pm this concerned me as I was to be married at 1:30pm, they said I could have my honeymoon suite early but I had to question this as I didn’t want my new husband to see me before the wedding. They allowed for my bridesmaid to sort this out. We then had to move rooms half way through preparing for my wedding to be honest this turned into quite a stressful time as some wedding guests were staying in the hotel therefore I was at risk of being seen. We then got items mixed up and I couldn’t find things I needed for my wedding under the time pressure to be ready, it kind of caused abit of unnecessary stress on top of nerves I already had. The food was amazing, I’m kind of unsure how I got a room service charge of £55 however? I did have room service delivery for £5 and I paid for 2 bottles of Prosecco for £40 at the bar who then offered to deliver this to my room I assumed I may get a service charge of £5 yet I seemed to have received a £55 charge? It says drinks? Did I get charged a second time for this? Although it doesn’t add up??? And I paid for all our drinks at the bar. Which over £10 for 3 bottles of children’s fruit shoots is really expensive and I believe the bar charges were the reason why my guests left early they couldn’t afford to keep drinking. My guests have also told me some struggled with booking a room and were given a number of fluctuating prices for the same room??? If I were mentioned they should have been £75 per room for 2 people yet some were asked to pay more? Again our honeymoon suite had no coffee for the room. When we went for the breakfast the tables hadn’t been cleared the staff we had to search out and we had to wait a lot for food to be replenished after we asked to see if there were more eggs coming or coffee, or orange juice. Due to these minor things I’ve had to mark down my experience as I feel some things have let my stay down slightly. More worryingly was the fact I’m aware that the year after I booked my wedding a celebrant who I had not hired and had been very pushy messaging my phone had been able to access my booking details and was aware my mum has booked a room for my wedding and other details, as I wasn’t interested in her services she said she worked closely with the staff at the hotel and could help me cancel my wedding? I then had to put in an emergency email to the coordinator at that time my concerns. I believe this was against data protection. I have had to work with a number of different coordinators which I understand is unavoidable but it made the planning hard as one offered certain things in my package but the next would be unaware and charge more. Plenty of space, but a little run down. I stayed for a work trip and had everything I needed available in the room, which was a spacious room. The timings for breakfast were not early enough for me to leave for my meeting and the room service menu was limited due to changes that hadn't been communicated. The food was not great but ok.
Not anywhere like previous visit. Very pleasant. Pleased to see James as had great service at Wetherby. Room fine. Extra heater useful. Shower good. Bar well stocked. Breakfast had lots of choice. The staff were very friendly. Corridor leading to room was very dingy. It’s a good location..lovely grounds but very dated scruffy interior...it could be beautiful with a revamp. Unfortunately we were woken at 3.30 one morning and 1.30 the next morning by noisy young people in the adjoining room. Not pleasant at all. The room was tiny and with weird layout. As far as meal was concerned the 2 of the starter items were unavailable for all of the 3 nights I stayed at the hotel. You will not find a staff in the Bar area and always have to look around the lobby for some hotel staff to tell them to find a staff at the Bar. Went to a wedding, the hotel were excellent with the service and the food was really good. Can you confirm that the Manager of Bankfield Hotel received my comments today, please. I clicked on reply to his letter (his first name was Blair). The staff re- arranged my accomadation to suit my needs which was much appreciated. The staff were always helpful during my stay. Thank you. Very pleasant and welcoming. Staff helpful and courteous. From booking through to the actual event has been a pleasure. The event itself went well. Although the hotel staff had a very busy weekend they still gave us time as a group. The staff are a credit to the hotel. I never stayed here, not sure why you think I did.